MyDerm® is an advanced 3D auto graft skin substitute meant for the repair of full thickness skin loss. This skin substitute is also permanent and has been proven to enhance wound healing. The research and development for MyDerm® was completed in June 2008 in the big animal study and Limited Clinical Application after undergoing several tests such as "Toxicology for Safety”, "Rejection on Implantation” and "Flowcytometry Cell Cycle Analysis”. National level of Clinical Trials is now being conducted at UKM Medical Centre. Who Can Use / Purchase MyDerm®? Doctors, medical professionals, specialists, consultants, surgeons and insurance companies. The end users shall be patients with medical or skin conditions. What Types Of Treatment Can MyDerm® Be Used? What Are MyDerm® specialties/advantages as compared to other conventional skin grafts? Autologous – meaning it originates from the patients' bodies and cultured to grow. As it is fully autologous, it is absolutely compatible with patients' own skin and has a NO chance of rejection. Bilayer – meaning the skin graft is bilayer by the use of our advanced 3D-HPD technology. As such, the tissue graft is also 3-dimensional. Mimics Real Skin – meaning the tissue graft would be both physically and mechanically similar to the host skin. This reduces the risks of scars or having a different skin colour. It also mimics the native skin in growth factors, proteins and other biochemicals. Ultimate Alternative For SSG – meaning that the conventional skin grafting methods are usually physically and emotionally traumatic for the patients as a patch of host skin from an unwounded body part is peeled and used for grafting. In comparison, MyDerm® can offer a less painful and more pleasant alternative to the SSG. 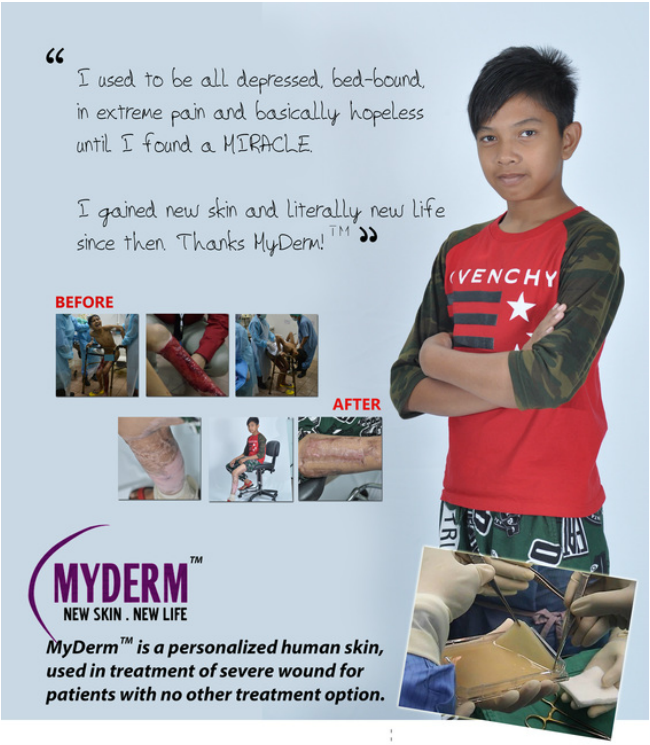 It Is Permanent Skin – meaning that MyDerm® provides a permanent graft for wounds without the repeated grafting because it is immunologically compatible. In SSG, repeated grafting is usually required if the skin falls off or until the permanent closure of the wound. Aside from the unnecessary pain, there are the additional costs and time too. MyDerm® is a preferred and better alternative for conventional SSG (gold standard) because there is less pain, healing is faster and possesses better cosmetic values, thus enable patients to enjoy an improved quality of life.